I’m back to share some more from my team meeting on Thursday; we had such a good time stamping, which we always do before we get down to business talk. 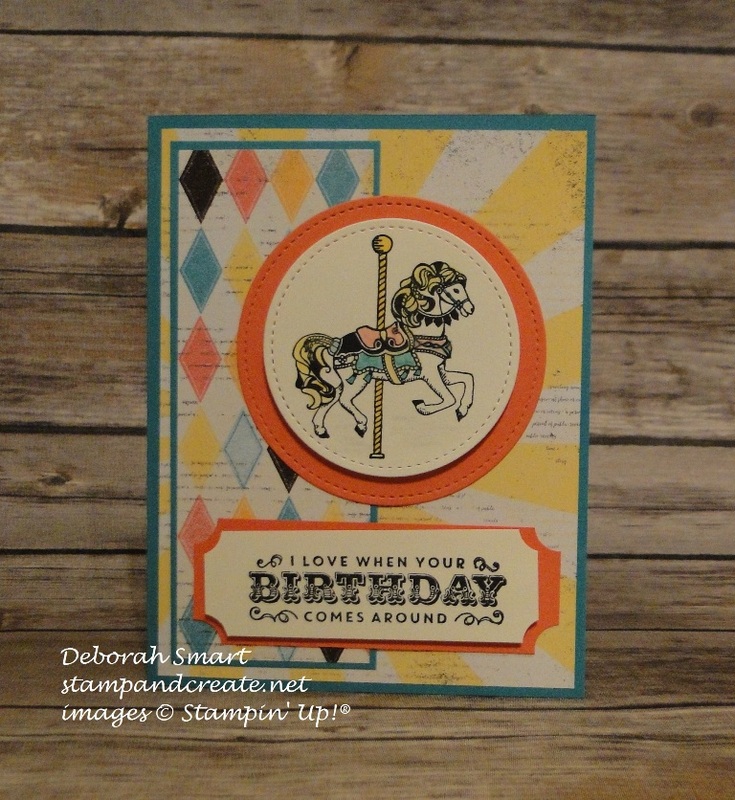 Today I thought I’d share the card that I created, and everyone stamped for themselves; I used the Carousel Birthday stamp set, which I’m borrowing from my team member, Lynn – whose projects I shared in yesterday’s post. If you didn’t see them, you’ll want to check them out -they are adorable! I got my inspiration from a card I saw another demonstrator, Billie Moane, post, and just made a few changes to make it my own. I started with a card base of Bermuda Bay cardstock, then added the sunburst design panel from the Cupcakes & Carousels Designer Series Paper Stack. I then layered the harlequin design, from the same DSP stack, on top of a piece of Bermuda Bay cardstock, and layered that onto my card base. 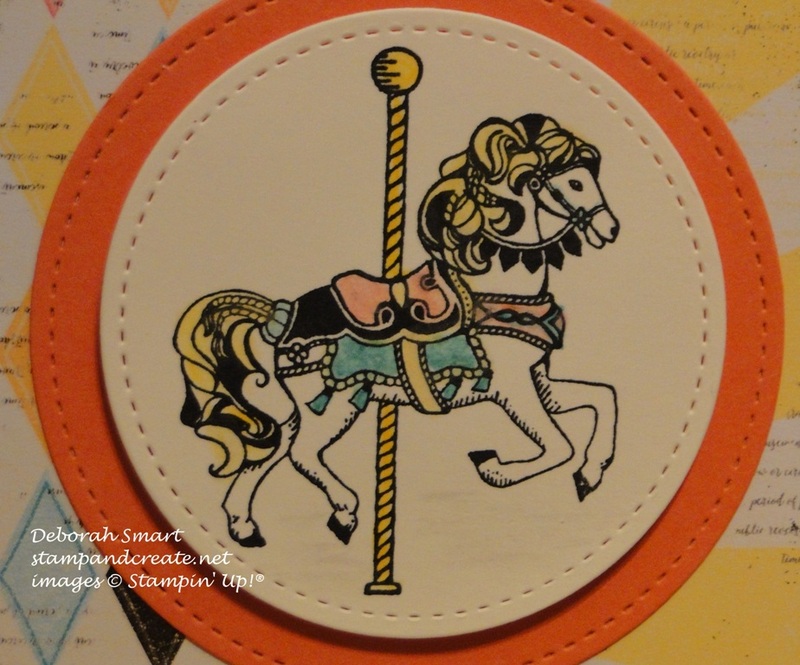 I stamped the carousel horse in Archival Black ink onto Whisper White cardstock, and used my Watercolour Pencils in Bermuda Bay, Daffodil Delight and Calypso Coral, with a Blender pen, to colour it. I die cut the horse image and the Calypso Coral cardstock circle below it using my Big Shot and the Stitched Shapes Framelits (the good news is that these should be back in stock next week! ), and layered it onto my card base. The sentiment was also stamped in Archival Black ink onto Whisper White, and mounted on a piece of Calypso Coral cardstock. I used my 1/2″ Circle Punch to punch out the corners of each layer – I like the old fashioned ‘ticket’ look this gives, which I think fits in with the carnival/carousel theme. I know I’m going to have to give this set back to Lynn, and buy my own – I’m just having such fun using it! 🙂 I think my team enjoyed making this card, too; everyone chose their own colours/combination for colouring the horse, and trying out the Watercolour Pencils with the Blender Pens. If you’d like to purchase any of the products I used to create this card, just click on the images below, and you’ll be taken directly to my online store. Of course, I’m happy to place your order for you – just send me an email! You’re also always welcome to join my Team – whether you want to just take advantage of getting your products at a minimum 20% off, or want to share the fun with others and sell products – there’s no obligation when you join up! And joining during SALE-A-BRATION means that you not only get $165 in whatever products you want for only $135, but you ALSO get to choose 2 MORE STAMP SETS FOR FREE! And no shipping costs! I still have to share Margaret and Chantal’s projects, so be sure to come back & see them.